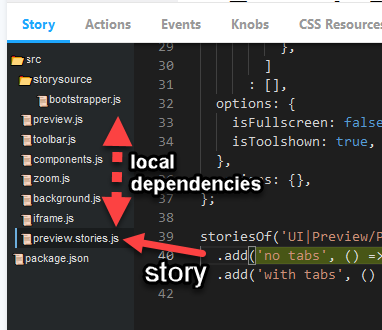 One developer wrote an adaptation for react live in storybook : https://github.com/vertexbz/storybook-addon-react-live-edit. I personally think it is useful to work with as a consumer of a library, but as a developer, the addon does not offer the possibility to change the component behavior itself. So I am seizing the opportunity to look into the existing storysource addon and to know how we can extract a “story” as a “project”. I can do that by implementing a webpack loader which can instrument the source code while loading the modules. Next steps are really challenging but not impossible : vue files parsing to find the pictures and templates, ability to require an entire directory (with require(‘./stories’) and to define a global config. I am not there yet, but I think this does not prevent me from working.